You can track expenses for any preservation from the Preservation>Expenses tab. 1. From Properties>Preservation, locate the preservation you wish to work with. 4. Enter a title for the expense in the Memo field, along with the Expense Amount, Expense Date, and any other desired information. 5. Click the Add button. You will now see the expense, as shown below. The expense amount you entered will be shown in the Expense Amount field. The Expense Total field will keep a running total of all expenses incurred for this particular preservation. 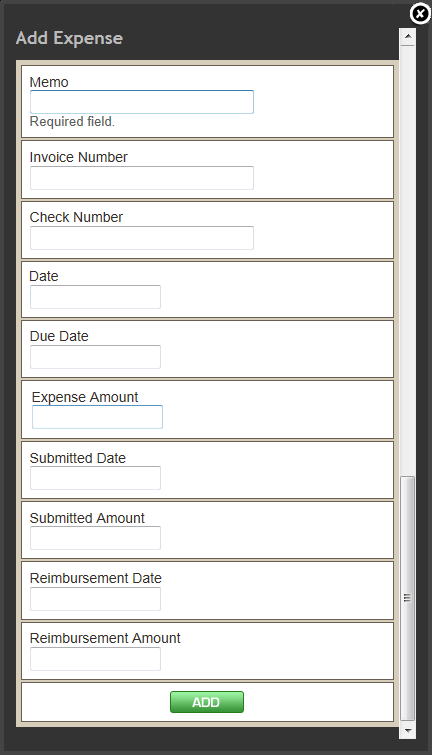 Expenses can be modified or removed using the Update or Delete buttons at right. Any expense or reimbursement amount you add on the Preservation>Expenses tab will also appear on the Properties>Expenses tab, under the Preservation sub tab (see below). This tab displays a complete list of all of the preservation expenses for the property. Any expenses or reimbursements that are added from Preservation>Expenses will carry up to the Properties>Expenses tab, and vice versa. For information on working with the Expenses tab, see Properties>Expenses.